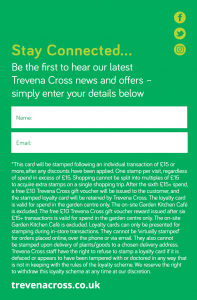 We have now launched our own Trevena Cross Loyalty Card, to give our regular customers something back for their continued support of the garden centre. A simple stamp system, the card requires you to collect six stamps (£15+ transaction = 1 stamp) after which you’ll receive a £10 Trevena Cross loyalty voucher to spend at the centre, on plants, sundries or gifts – your choice! This scheme operates separately from the Garden Kitchen Cafe, who handle their own loyalty schemes (e.g. coffee cards etc) and so cards cannot be stamped for transactions completed in the cafe, and the £10 Trevena Cross loyalty vouchers can not be redeemed in the cafe either. If you’d be interested in having one, please ask a member of the team behind the counter about the card on your next visit! Only those individuals with exceptional eyesight will be able to read the terms & conditions on the back of the loyalty card (!) so we have included them below for your convenience. This card will be stamped following an individual transaction of £15 or more, after any discounts have been applied. One stamp per visit, regardless of spend in excess of £15. Shopping cannot be split into multiples of £15 to acquire extra stamps on a single shopping trip. 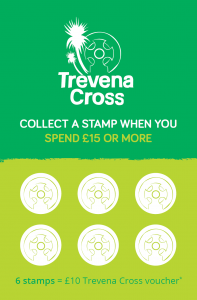 After the sixth £15+ spend, a free £10 Trevena Cross gift voucher will be issued to the customer, and the stamped loyalty card will be retained by Trevena Cross. The loyalty card is valid for spend in the garden centre only. The on-site Garden Kitchen Café is excluded. The free £10 Trevena Cross gift voucher reward issued after six £15+ transactions is valid for spend in the garden centre only. The on-site Garden Kitchen Café is excluded. Loyalty cards can only be presented for stamping during in-store transactions. They cannot be ‘virtually stamped’ for orders placed online, over the phone or via email. They also cannot be stamped upon delivery of plants/goods to a chosen delivery address. Trevena Cross staff have the right to refuse to stamp a loyalty card if it is defaced or appears to have been tampered with or doctored in any way that is not in keeping with the rules of the loyalty scheme. Don’t hesitate to get in touch if you have any more questions, and we look forward to welcoming you to the Trevena Cross Loyalty Scheme really soon!